Mortgage Architects is using its high-flying brokers to recruit other brokers, allowing them to share their success stories in an increasingly competitive market for networks. The new broker-driven advertising campaign has MA members endorsing the network in ads focused on reaching the channel. 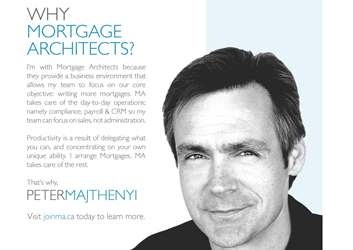 They use their success stories as testament to the benefits of being with Mortgage Architects. The campaign is an all-out media blitz in print, online and will be featured at trade shows and events. “Our ads feature Mortgage Architects brand ambassadors from across the country that tell prospective brokers why they joined MA,” explains Karen Fogel, director of marketing. The campaign also features Mortgage Architects executives and explains why they chose to be a part of the success of the MA brand. CEO Ron Swift is among them, featured in upcoming advertisements to showcase the core principles that drive the company. “We will be communicating our key services and benefits of joining directly from those in our network,” says Swift. The Mortgage Broker industry here in Canada will never increase its market share until brokerage firms stop cannibalizing each others brokers. Brokerages should invest in recruiting externally, training and mentoring new brokers. Let’s stop fighting over our currently small slice of the pie and work together on increasing our market share. Great comment James, and so very true. Wait a moment, people have a right to decide what company they want to associate with. If you start your career with one firm are you chained there for life? That's just silly. If a newcomer grows their business to the point that someone wants to chase them, more power to them. If networks and superbrokers want to spend money stealing each others agents, that's their business. This is one of the lowest barrier to entry professions in Canada. Nothing stops anyone from hiring brand new agents and brokers except the willingness to do so.